Okay…I might be giving this away…but, a recent post on this blog is in some way related to this location. Good luck. from → Where on (Google)Earth? The detail is amazing, I think I can even see Scott Norwood shanking field goals on google earth! yes…this is the Buffalo-Niagara Falls region. 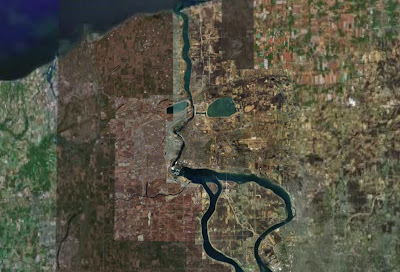 That is the Niagara River separating New York and Ontario…Niagara Falls right in the center. Buffalo is to the lower right. My home stomping ground. I grew up in Welland, Ontario, about 15 miles from Niagara Falls, just to the west.